During the summer of 1947, Dr Faraday (Domhnall Gleeson), the son of a housemaid who has built a life of quiet respectability as a country doctor, is called to a patient at Hundreds Hall, where his mother once worked. The Hall has been home to the Ayres family for more than two centuries. But it is now in decline and its inhabitants - mother, son and daughter - are haunted by something more ominous than a dying way of life. When he takes on his new patient, Faraday has no idea how closely, and how terrifyingly, the family’s story is about to become entwined with his own. 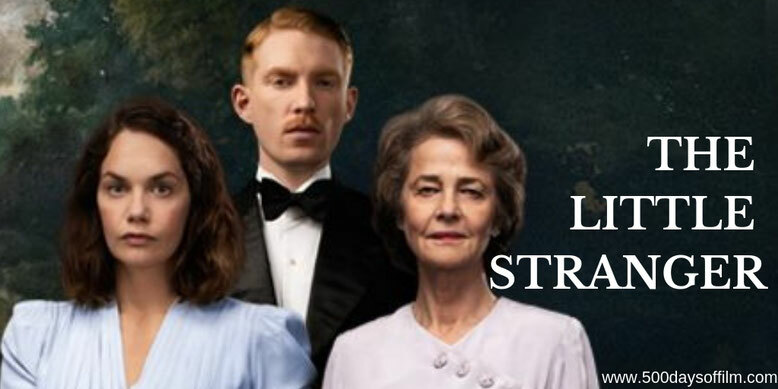 The Little Stranger is an atmospheric, slow burn drama that explores the challenges within the British class system after the Second World War. Director Lenny Abrahamson bring us a fascinating period character study - a story of a man determined to rise above his station and a woman desperate to escape the chains of decaying privilege. Wait... isn't this supposed to be a ghost story? The Little Stranger is a lot of things. What it isn’t is a horror film - not in the traditional sense at least. Don’t go in expecting jump scares or those twists, turns and shocking reveals that we have come to expect in many ghost movies. While Abrahamson creates an unsettling and chilling sense of dread (thanks in large part to the film’s fantastic sound design), he steadfastly refuses to go down that well-worn path. The Little Stranger remains ambiguous and restrained from its first until its last scene. This could well prove frustrating for those seeking the thrills of a more traditional haunted house movie. The film’s glacial pace and the coldness of its characters could also prove off-putting. However, while the ghostly element in The Little Stranger is intriguing, ultimately it proves to be the least interesting part of the story. Far more compelling in this beautifully constructed tale (the period details are wonderful) are the complicated inner lives of its central characters. Domhnall Gleeson gives a superb performance as Dr Faraday. Deeply repressed, he is rarely himself - playing a part in order to fit in with the upper class world of Hundreds Hall. This is a world that he has envied since he was a child. It is also a world that remains (often brutally) aloof and indifferent to his desire. A house call to treat the maid at Hundreds Hall brings Faraday into its toxic orbit and also into the company of Caroline Ayres. He soon becomes fascinated by her and her lifestyle. However, what does he most desire - Caroline or the Hall? No one is more aware of this than Caroline herself. Beautifully played by Ruth Wilson, Caroline is trapped at Hundreds Hall, struggling to keep her family together. With an emotionally and physically damaged war veteran brother (Will Poulter) and a mother (Charlotte Rampling) convinced that the Hall is being haunted by the ghost of her dead daughter, this is a far from easy task. Both Faraday and Caroline see each other as a means of escape but The Little Stranger’s unsettling atmosphere and spiraling sense of dread leave us to wonder if anyone will truly escape from this dark tale. You may come to Lenny Abrahamson's film for the ghost story but you’ll stay for the two central performances of Caroline and Faraday in The Little Stranger. For their stories are what truly haunts Hundreds Hall. The Little Stranger is based on the novel by Sarah Waters. If you enjoyed Ruth Wilson in The Little Stranger, I would recommend her performance in Dark River. Domhnall Gleeson also worked with Lenny Abrahamson on his brilliantly eccentric film, Frank. Have you seen The Little Stranger? If you have, what did you think of this movie? Let me know in the comments section below or via Twitter. You can find me @500DaysOfFilm.